Tim, Steve and Rob Comeau announce the passing of their mother, June McLeod of Lincoln NB on January 19, 2019 at Hospice House in Fredericton. June, though born in Rusagonis, November 2, 1933, maintained and adhered to her strong English values and roots. Raised in England during the war, she was able to recount with vivid detail childhood war experiences. She returned with her family to Canada when she was 17. She trained as an RNA and was employed at the Victoria Public Hospital and the DECH in Fredericton. 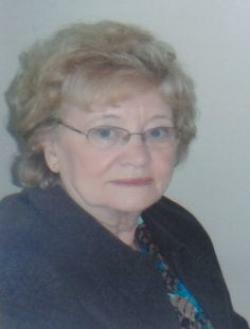 June and her late husband, Jim McLeod, were the owners of Capital Trucking. They enjoyed traveling and going to the dances at the Lincoln Lions Club. June spent her last fourteen years visiting her sons in Calgary, attending card parties and taking the occasional bus tour. She thoroughly enjoyed the wildlife that visited her yard. She was a strong, fiercely independent woman who lived her life on her terms. She was a force to be reckoned with. She is survived by her three sons Tim, Steve, Rob (Katrina Baxter) and grandchildren Rochelle, Josh, Joey, Olivia & Julia. June was predeceased by her husband Jim in 2004, daughter in law Marla Hupka 2004, daughter in law Laurie Lawrence 2015. There will be no visitation or funeral service, as per June’s request. The family would like to thank Vianne from Extra Mural Oromocto and everyone at Hospice House. In June’s memory, donations and acts of kindness towards Hospice House Fredericton would be appreciated.